Thanks to Mike over at Chapeau Noir Golf and Stephanie Wei at Wei Under Par for keeping us informed of another endorsement deal signed sign by one of our favorites Ryan Moore. Ryan has gone from having no sponsors to signing with Scratch Golf earlier in the year (he's using their irons and wedges) to now signing a three-year contract with TRUE linkswear a Dallas-based apparel and footwear company. The first thing I noticed is they have no spikes and they're definitely a different design from your more conventional golf shoes. I really like the color as well as the subtle logo on the outer sole. 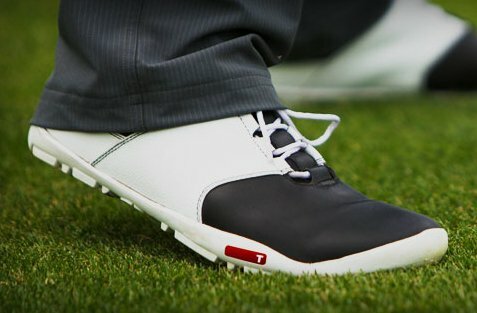 Right now you can't get these shoes yet but it looks like TRUE golf shoes will be available in the Fall through truelinkswear.com and TRUEs will also be sold in a small number of golf club shops in top U.S. markets, with potential retail availability as well. 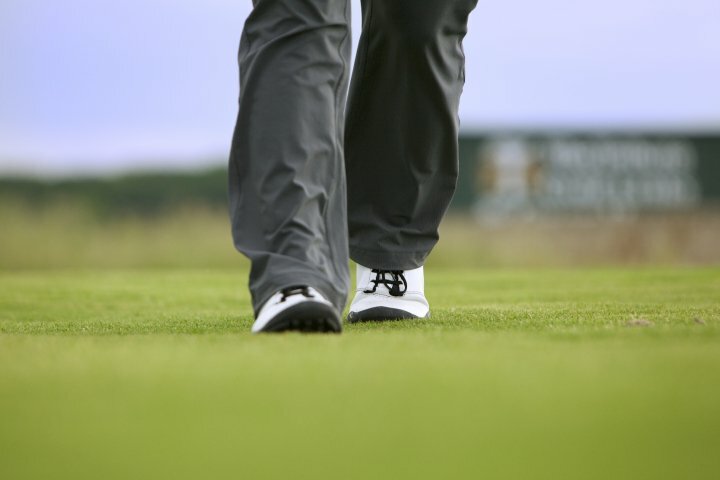 “I’m wearing TRUE linkswear golf shoes because they’re the lightest, most comfortable shoes I’ve ever worn. I’m a feel player and every part of the way I experience the game of golf, from the teebox through the green depends on having a solid connection with the ground. These shoes provide that connection in a way I’ve never felt before. I was so excited to learn about this golf shoe concept, and when I finally got to wear the shoes for the first time, I knew I wanted to wear them on Tour. Here's a few snippets from the press release. Ryan obviously loves them and has apparently had lots of input in the design. Ryan Moore is wearing a prototype on Tour while the retail shoes are currently in production. “The last two years, I have been looking for footwear that I think gives me an advantage. These shoes are the lightest, most comfortable shoes I’ve worn on the golf course and they really improve my sense of balance and connection with the course. I knew the first time I played in them that I wanted to wear them as soon as possible,”said Moore. Moore and his family will also be deeply involved in the company, supporting product design and development, as well as ongoing marketing and production. “We have focused, for the last two years, on aligning Ryan’s values and desire to only play equipment he believes will help his game, with business opportunities that allow him to retain that alignment for many years,” said Jeremy Moore, Ryan’s manager. Investing in different boutique golf equipment companies at such an early age seems to be a bit risky. After all, if you decide you'd like to switch clubs, it's hard to do when you have a financial and emotional incentives not to do so. Does anyone believe the thought of switching to a Callaway or TaylorMade driver hasn't crossed Tiger Woods' mind a few hundred times over the course of the past several years? Oh well. I hope these relationships work out for Ryan. I've always loked Moore's "no particular style" style of attire. After holding out on the sponsors it will be interesting to see if he can help grow these brands. Great post.